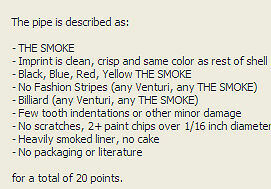 The value of pipe #694 is 20 points. The 2006 Columbus pipe show has gone down in my mind as having the greatest generosity from other pipemen I have ever seen. I got five pipes, not a huge number compared to other shows, but they were all given to me—no charge. Amazing! This well-used pipe came from Brian Levine and, although I told him it might clean up well, he insisted that I just take it saying, "You can owe me one." I have a very nice example of the color/shape in the collection so I am offering it on the Pipes for Sale page. I feel a bit guilty asking anything for it. On the other hand, it's worth more than I'm offering it for. Michael Honeycutt took a liking to this one and bought it.